eBay Store category Sign Up Now ! 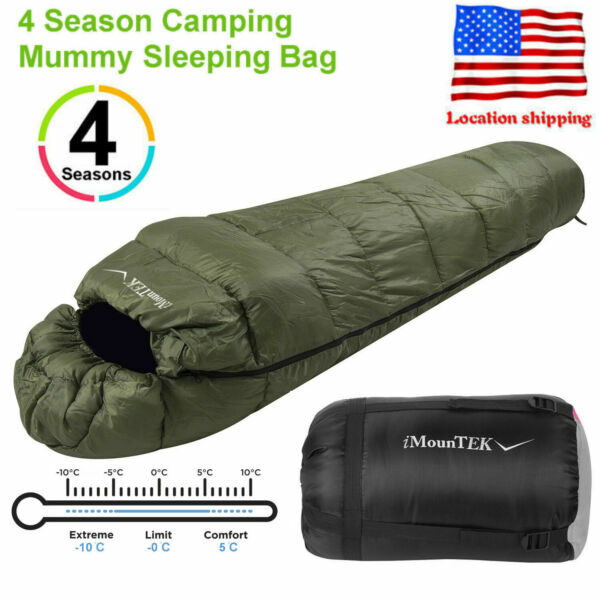 You may also like Olive Green Mummy Sleeping Bag Warmly -5-10 ℃ 4 Season Outdoor Camping Hiking US Product Description 4 Season Camping Mummy Sleeping Bag Features & SpecificationsFeatures:Provides a warm and cosy sleep in cold damp night when outside by maintaining a constant optimum temperatureAdjustable drawstring mummy hood keeps your head and face warm while maximizing heat retentionConvenient full side dual zip with weatherstrip that helps reduce heat loss (can be zipped open inside and out)Roomy footbox allows a more natural and comfortable position for your feetInternal pocket for storing cellphones, tablets and other itemsSewn-in loops at bottom let you secure the sleeping bag to the ground so that you won’t roll offPerfect for hiking, camping, backpacking, travelling and moreEasy to be compressed into the storage sack that can be carried on hand, over the shoulder or on the back with adjustable straps and drawstring closureIdeal for both cold and warm seasonsWater-resistant and ripstop polyester shellMachine washable (front loader)Specifications:Material of sleeping bag: Shell: T190 polyester; Lining: T190 polyester; Filling: hollow cotton Material of storage sack: Oxford fabric Temperature rating: -5°C – 10°CSize(unfolded): 86.6” x 31.5” x 19.7”/220 x 80 x 50cm (L x W x H) Weight: 1600g/3.54lbs Available colors: black+gray, olive green, pink Package size: 15.75” x 9.45” x 9.45”/40 x 24 x 24cm (L x W x H)Package weight: 1.6kg/3.54lbsDescription4 Season Camping Mummy Sleeping BagSlip into this sleeping bag and sleep tight tonight whether you’re camping, hiking, backpacking or travelling. It features a mummy shape design that helps maintain a constant optimum temperature by keeping warm air inside and close to your body without circulating and cooling down. Cinched with a drawstring, the hood can be easily adjusted for wind and temperature control. Pull it tightly over your head to trap the warm air in, loosen it to let the sleeping bag cool down.Package Contents1 x 4 Season Camping Mummy Sleeping Bag 1 x Care Instructions Product Details Terms & Conditions Warranty Policy: Payment Method: Shipping Information: Returns and Refunds Policy: Feedback: Warranty Policy: *100% Money Back Guarantee & 12 Months Warranty From Our Store. *All Our Products Are Packaged in Good Condition and One Day Shipping Payment Method: We accept PayPal. This is the most secure method to make payments for products or services online. Shipping Information: *All of our products ship directly from our different warehouses across the United States. We offer FAST and FREE SHIPPING on all orders *We are able to provide next day delivery for our orders 100% of the time for orders before noon on week days. We will post all items in the most appropriate packaging to ensure that they are not damaged on dispatch. Returns and Refunds Policy: 100% Money Back Guarantee! We work hard with all of our customers to ensure that they are getting an excellent shopping experience. Refunds are available for returned items. We accept returns within 30 days from the date you receive your item. If you do have a concern or want to return an item please contact us before opening a return case. We will professionally handle your concerns/returns. Feedback: *Feedback is extremely important to us and eBay. We are committed to satisfying our customers to the best of our endeavors. We Solemnly Promise: 100% SATISFACTION GUARANTEED IF NOT 100% MONEY BACK GUARANTEED! Satisfied? *If you are satisfied with our service and product please do give POSITIVE feedback and give us 5 stars in all categories. Unsatisfied? *If you are unsatisfied with the service or product that you received please contact us via eBay message and we will help to resolve the issue as soon as possible. *Please note that Opening Case - Negative Feedback or Neutral Feedback DOES NOT help anyone. In fact, it is a time consuming procedure for eBay and vendor. Instead, we humbly request you to contact us directly. We assure you that we will try our best to satiate your needs and resolve issues.Contact Us: *Communication is KEY to helping us give you the best experience. The best way to contact us is through eBay messages. Always feel free to contact us with any issues or concerns or issues and always reply to you within 24 hours. We will always do our best to answer any questions and resolve any issues promptly. About Us: We at Market Place know how important it is for you to get what you ordered and get it fast. We offer a variety of 100% authentic and brand new products at great prices. We work with the best suppliers of high quality products to bring you only the best items. All of our products ship directly from our different warehouses across the United States so that you get your items quickly and in perfect condition. We have tens of thousands of satisfied consumers! Thank you very much for taking the time to browse this listing; We would be very grateful if you could take a look at my other items; We wish you a wonderful day! Have a good one!